This Member Update was provided by Christy Allen, Assistant Director for Discovery Services at Furman University Libraries. In the Fall of 2012, the Digital Collections Center at Furman University Libraries embarked on an ambitious digital project: The Peter Wexler Digital Museum at Furman University. This project was a collaborative effort between the Furman University Libraries and New York City artist, theatre designer, and producer Peter Wexler. 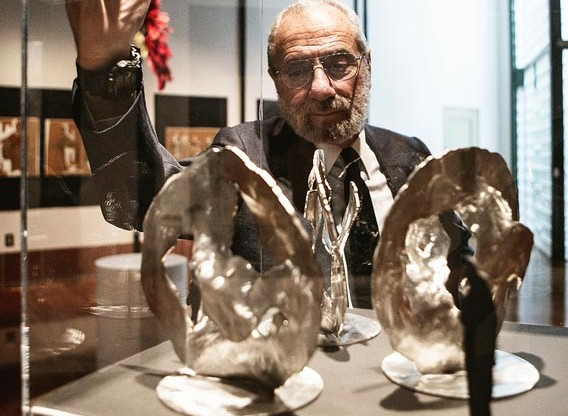 For five decades, Wexler has been recognized as a force in performance art. He is a designer of scenery, costumes, lighting, concerts, performance spaces, and outdoor facilities, as well as a producer and a studio artist. His credits include designs for Broadway, off-Broadway, The Metropolitan Opera, The New York Philharmonic, and The Boston Pops. Wexler’s sketches, paintings, and models are held by several libraries such as The New York Public Library for the Performing Arts, The University of Arizona, and Binghamton University. However, the most impressive selection of his life’s work resides in his own studio in Manhattan. Wexler has over 60 years of his creative output, ranging from sketches on scraps of paper to complex full-stage models. All of the art is meticulously categorized and organized—a veritable treasure trove for theatre and art enthusiasts. However, as with most private collections, there was limited access to the work. For years Wexler entertained the idea of making it freely and openly available online. In 2012, Wexler partnered with Furman University to make that dream a reality. A generous donation from Furman University Trustee Todd Ruppert and his wife, Karen, allowed this exciting project to move forward. The first step involved moving Wexler’s artwork from New York to Furman’s campus in Greenville, South Carolina. The collection filled one large storage room, two conference rooms, and an empty office in the James B. Duke Library. Our initial estimates indicated that there were over 30,000 discrete items in the physical collection! It was daunting, to say the least. Rick Jones, Manager of the Digital Collections Center was appointed as project manager. He had worked in libraries for over 10 years, including two years with the Digital Collections Center; he also had a strong background in studio art and an MFA. This project provided him with the perfect opportunity to leverage both his digitization knowledge and his artistic skills. 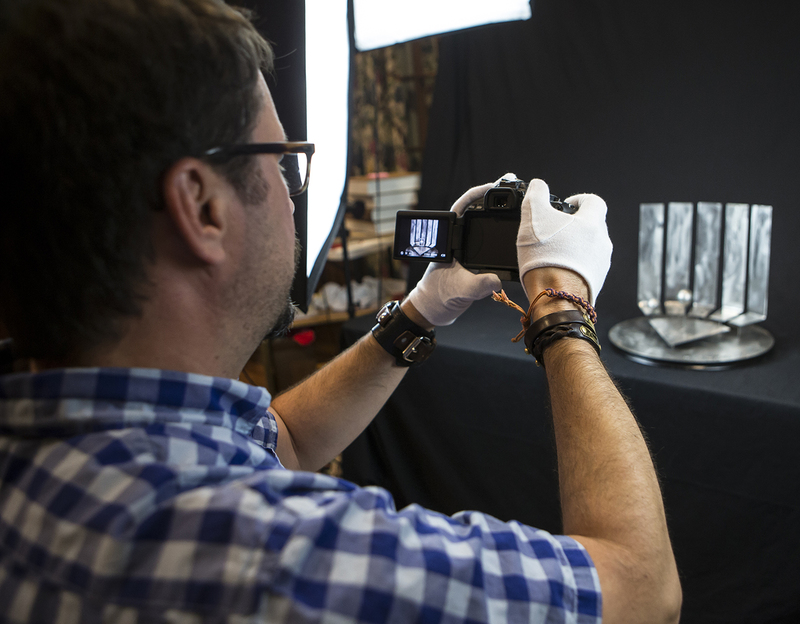 After some basic processing of the physical collection, around 7,500 items were selected for digitization. These items included all of Wexler’s artwork (sketches, designs, models, and photographs) and framed theatrical posters/programs. Due to limited resources, we did not digitize all of the ephemera or any of the professional correspondence and files. The majority of the materials selected for digitization were oversized or three dimensional, and couldn’t be scanned. Digital photography was the only solution, so we built a small photography studio in one corner of a conference room. We then purchased advanced lighting kits, spotlights, two backdrops, and a Canon Rebel EOS camera. With all the equipment in place, Rick Jones began photographing and training students to photograph. This wasn’t a typical digitization project, so we used rather unconventional photography methods. Lighting and backdrops were used to create an artistic atmosphere and photographs were taken from all angles and with various lighting effects to showcase the beauty of the artwork. In many ways, the digital photographs are as much artwork as the items they represent. The next step was the most time-consuming one. The digital photographs were enhanced using Adobe Lightroom and Photoshop to improve color, lighting, and to remove imperfections. We were committed to presenting truly museum-quality photography in the collection, so a lot of our time was devoted to these enhancements. Digital Collections Center staff and seven students were involved in the digitization and digital manipulation of each digital file. to a specific Wexler project such as a play or opera. Items within the digital portfolio were organized to reflect Wexler’s creative process. In a typical digital portfolio, the first files are rough concept sketches and the last files are photographs of the finished product. When complete, the Digital Museum will contain over 300 digital portfolios. Finally, quality control was conducted. Peter Wexler was an active participant, and reviewed each digital portfolio, offering suggestions for additional enhancements. After all the digital files were reviewed and approved, they were saved as TIFFs. These lossless master files were used to create JPG derivatives for upload into Furman’s digital collections software, CONTENTdm. Developing metadata for the Digital Museum also proved a challenge. We ended up creating two levels of metadata based on the Qualified Dublin Core schema. First, we developed project-level metadata which applied to all items within a specific digital portfolio. Examples of project metadata fields include: project name, date, client, and credits. Then we had item-level metadata such as: title, format, media, and dimensions. We tracked the project level metadata through an Excel spreadsheet that was created in collaboration with Peter Wexler. Kathie Sloan, our Digital Collections Specialist, and I worked primarily on creating the item-level metadata and uploading files into CONTENTdm. The final and most complex piece of the Digital Museum was the creation of the website which provides information about the project, offers previews for each digital portfolio, and serves as a gateway to CONTENTdm. The website was built by Scott Salzman, Furman’s Web Discovery Librarian, using LibGuides v2, the newest release of the popular library web content management system. We use LibGuides as the platform for our Library website, so it was a natural choice for the Digital Museum site. However, there were multiple challenges in designing the site in LibGuides v2. The website needed to be able to incorporate project-level metadata from the Excel spreadsheet and item-level metadata exported from CONTENTdm while dynamically creating slideshows of Wexler’s art. It also needed to have a completely custom design and layout and be fully responsive. Scott Salzman was able to utilize JSON files and custom scripting to successfully build out the complex functionality and streamlined aesthetics of the website. 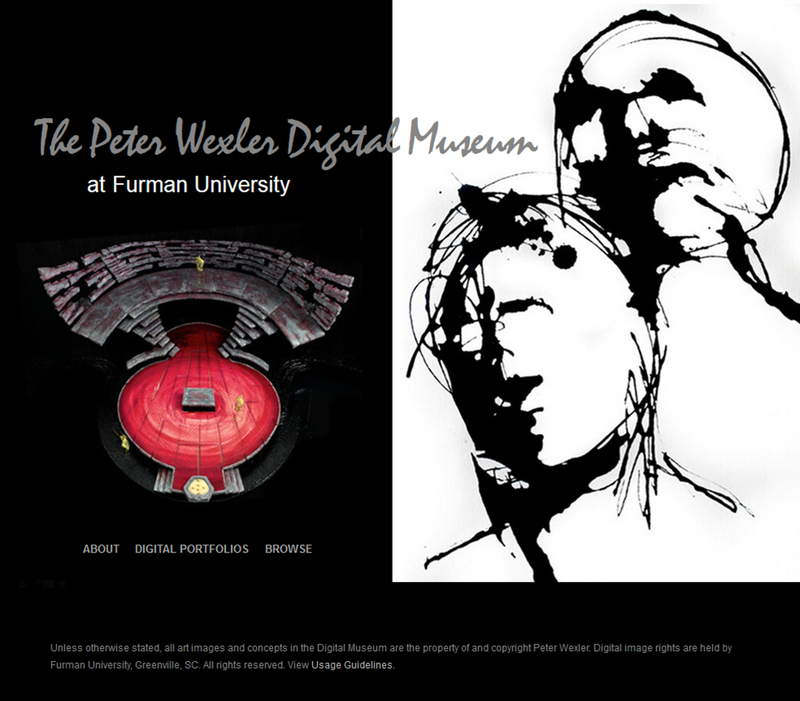 After two years of hard work and unique challenges, the first phase of The Peter Wexler Digital Museum at Furman University is scheduled to go online in late January 2015. It will contain over 200 digital portfolios and nearly 7,000 items with additional items added as time and resources permit. When it goes live, the Digital Museum will be the most comprehensive free online collection of theatrical materials known to exist. Moreover, all of the materials to which Peter Wexler owns copyright will be made available through Creative Commons. This means that faculty, students, researchers, and enthusiasts can freely download, distribute, and create derivatives of the images for non-commercial purposes. I have talked to numerous Theatre faculty about the Digital Museum and they are excited by the opportunities it offers for teaching and research.